Although intended by architect James Hoban to be the "Common Dining Room," the Green Room has served many purposes since the White House was first occupied in 1800. The inventory of February 1801 indicates that it was first used as a "Lodging Room." 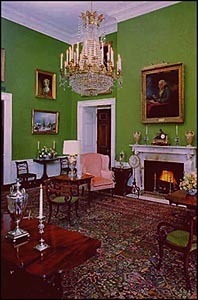 Thomas Jefferson, the second occupant of the White House, used it as a dining room with a "canvas floor cloth, painted green," foreshadowing the present color scheme. James Madison made it a sitting room since his Cabinet met in the East Room next door, and the Monroes used it as the "Card Room" with two tables for the whist players among their guests. The Green Room was completely refurbished in 1971. Its walls were re-covered with the delicate green watered-silk fabric originally chosen by Mrs. Kennedy in 1962. Draperies of striped beige, green, and coral satin--a major part of the 1971 renovation--were carefully designed from a pattern shown in an early 19th-century periodical. The coral and gilt ornamental cornices are surmounted by a pair of hand-carved, gilded American eagles with outspread wings. The eagle, patriotic symbol of the United States, was one of the favorite decorative motifs of the Federal period and appears in many forms in the room.